I know from personal experience what a Panda penalty can do to an ecommerce store. Simply put, the traffic stats start heading south, and they don’t come back quickly! While I’m sure you have tried your best to create a great website and optimise it well for Google, it can be very tempting to cut corners, and this is exactly what the Panda algorithm feeds off of, the lazy website owner. Now we will go over how to fix your ecommerce website from a Panda perspective, going over each type of page, the common problems and the solutions. So duplicate content is a big problem with the Google Panda algorithm, and therefore if you are utilising the same text across multiple pages, then this will create problems. Also if you are copying text from other websites (such as a manufacturers website) without adding anything of your own, this will also cause a penalty. This will allow you to rank the landing page for the product keyword variations, while controlling the duplicate content that Google indexes. 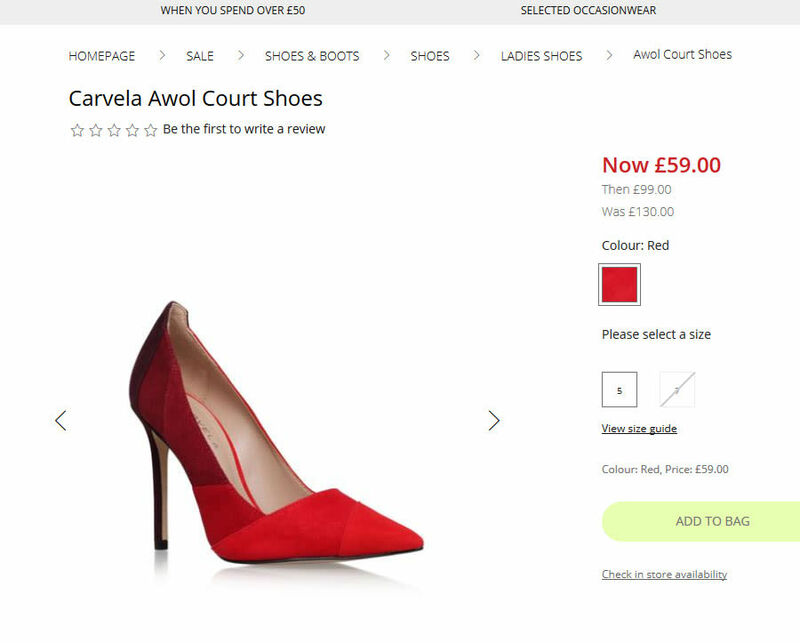 A shoe shopping website has multiple types of red shoes in the same style, with small variations in design. 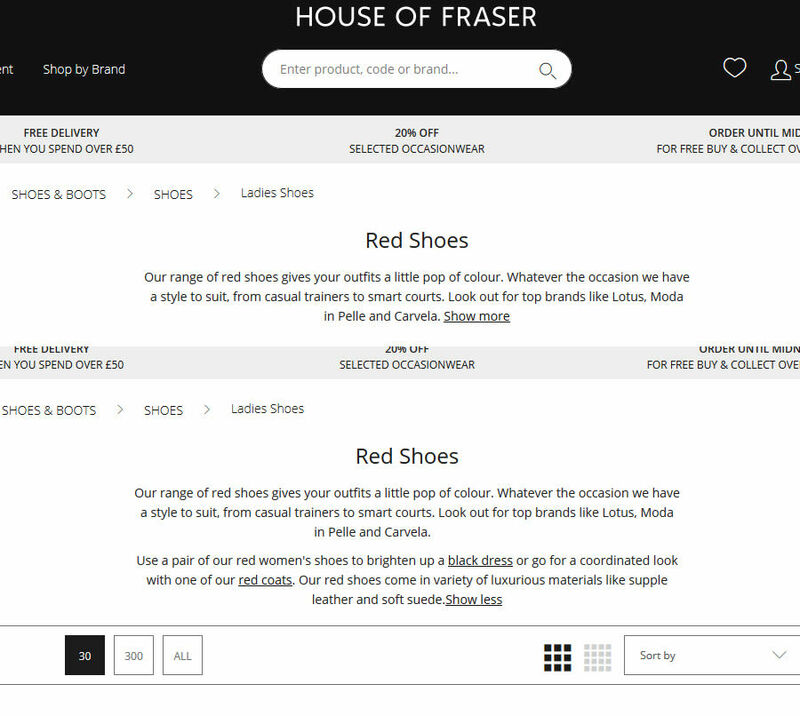 Each product page can’t target keywords such as “red shoes” or “red shoe type”, as they would be competing against each other, and require a lot of unique content. The solution would be to create a landing page for “red shoes”, which would target lots of types of “red shoes” related keywords, and link to the product pages from this page. To understand this, first imagine that Google is looking at the percentage of unique text on a page to determine if it’s a good quality page or not. Then imagine your category page, ignore things like the menu, the sidebar and the footer, and think about the bit in the middle that changes on each page. Now think about how much of that is “unique” ie not repeated anywhere else on the website. If your percentage starts to drop around the 50% or less mark, then you’ve got a problem. 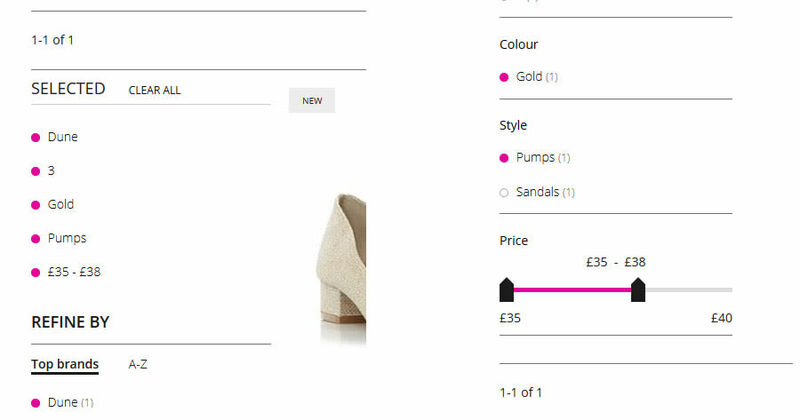 CMS tend to pull in small snippets of text from the product pages to display on the category list. You can double check this by checking the source code of your page for parts of your product description. While this isn’t terrible on it’s own, if you have no other unique content on the page then Google sees it as a weak page, and is more likely to penalise your website. All you need to do is add relevant and unique snippets of text to the page, wherever your CMS allows you to place it. A common way to add SEO value to your page without impacting on conversions is to use a “show more” text link that hides part of the page content from users. As you can see it gives you the ability to hide the extra text, that is really just there for Google to see anyway. The next step is to edit your CMS to remove the product description snippets from your category templates, however it would be impossible to cover each potential CMS in this guide, so a Google search will help you find what you’re looking for. The basic rule here is we don’t want Google to index a page that doesn’t provide us with some SEO benefit. Therefore pages with very little content that are simply there to satisfy the user, or pages that contain generic legal copy that isn’t thematically relevant to our website, aren’t required to be indexed in Google. This will help to make sure only the valuable pages from an SEO perspective are seen by Google, helping to avoid a Panda penalty. This is a very common problem with a various types of CMS. They end up creating new urls when someone uses a filter on the category page (like filtering by price or size). When we look at this from a “thin content” perspective, it’s creating a lot of urls that Google can index that have very little unique content on the page. The best way to fix this is to use canonical urls on category pages, which tell Google that this filter url is simply a variation of the main page, and shouldn’t be indexed on its own. A CMS will often create a new page when someone searches for a keyword in your store. This isn’t a problem in itself, but if Google can index these pages, you leave your website vulnerable to both a Panda penalty, and a negative SEO attack. To easily solve this, you need to set your search pages to noindex. This will stop Google from crawling urls that start with search#, fixing your potential problem. This can be a big problem with ecommerce sites, where products are constantly going out of stock, with sales coming and going, and with big product inventories scaring off potential users before they find what they’re looking for. This will show you your meaningful landing pages that have the highest bounce rate. From here you can go down each page and try to work out why they would have a poor user experience. Categories: include relevant choices (sub category links) above the fold that are easy to click / tap on mobile. Categories: make sure the headline is relevant to the keywords targeted. Categories: think about every possible user intention for your keywords, and try to serve those intentions above the fold. Products: make sure out of stock products are redirected to the correct category pages. Products: make sure the first image seen is of the most popular product variation. Products: try to gather positive reviews for all products. Products: make further information (such as FAQs) easily available. Make sure all of your pages are easy to use on desktops, tablets and mobile phones. Make sure your page load as fast as possible. Panda Recovery Times – How long does it take? How often does the panda algorithm refresh? Noone really knows as it isn’t disclosed publicly. There is speculation that it can take up to 6 months for the Panda algorithm to refresh, however without an official response from Google it isn’t a solid guess. Either way, solving these problems will help increase conversions and user engagement before the Panda penalty is released. Need help with your Panda penalty? 2 Panda Recovery Times – How long does it take? 3 Need help with your Panda penalty?